Once upon a time, tradition typically dictated wedding decisions. But couples are crafting new fairytale events these days, revising the standard storyline to create weddings that reflect who they are as a twosome. This new chapter of their lives starts with the right place. Around Asheville, the choices for wedding venues are numerous and give new meaning to variety. Wedding at a brewery? Sure. In a diner? No problem. Wedding planner Alex Fisher says, “Quirk is definitely in.” But whether it’s a luxurious inn, riverbank, barn, or mountaintop, a couple’s proclivities tend to guide the decision. The venue sets the tone for other big decisions, like the menu and decorations. Whether it’s been done before or not, Alex is game to give any idea a chance. “I always say, ‘It never hurts to ask!’ Especially when it comes to a unique venue like an art gallery, arcade, or history museum,” she says. One such place has become a wedding destination in the Brevard Arts District. The Brevard Lumberyard (brevardlumberyard.com), a revitalized 1908 lumber warehouse, carries a retro appeal with corrugated metal, bricks, and murals. Owner Josh Leder says this downtown venue can accommodate a five-star experience or simply a cookout. The lumberyard, also used as a performing arts venue, can accommodate 300 guests, indoors or outdoors. The facility includes a fire pit and old fire truck. Many venues offer flexibility. Appalachian Farm Weddings (appalachianfarmweddings.com) in Waynesville may have farm in the name, but owner Sarah Claire has seen all kinds of weddings at her rural location, from vintage to chic. “Our strengths include breathtaking views that surround you,” says Sarah. 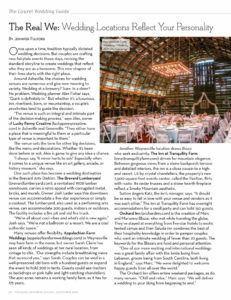 Couples can be wed in a well-preserved old barn with a hundred guests or expand the event to hold 300 in tents. Guests could see tractors as backdrops or pink tulle and light-catching chandeliers. The 400 acres remains a working family farm, as it has for 175 years. Another Waynesville location draws those who seek exclusivity. The Inn at Tranquility Farm (innattranquilityfarm.com) strives for mountain elegance. Between gorgeous views from a stone backporch terrace and detailed interiors, the inn is a close cousin to a high-end resort. Lit by crystal chandeliers, the property’s new 2,500-square-foot events center, called the Pavilion, flirts with rustic. Its cedar trusses and a stone hearth fireplace reflect a Smoky Mountain aesthetic. 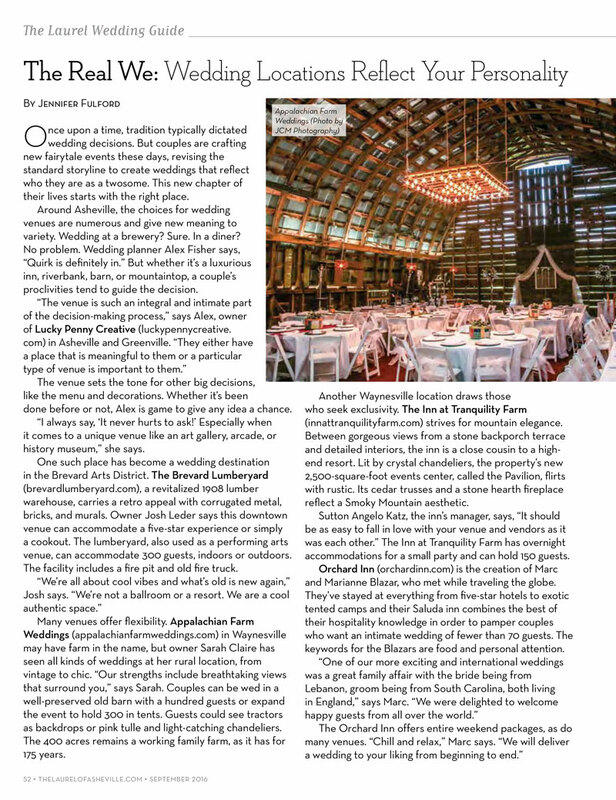 Sutton Angelo Katz, the inn’s manager, says, “It should be as easy to fall in love with your venue and vendors as it was each other.” The Inn at Tranquility Farm has overnight accommodations for a small party and can hold 150 guests. Orchard Inn (orchardinn.com) is the creation of Marc and Marianne Blazar, who met while traveling the globe. They’ve stayed at everything from five-star hotels to exotic tented camps and their Saluda inn combines the best of their hospitality knowledge in order to pamper couples who want an intimate wedding of fewer than 70 guests. The keywords for the Blazars are food and personal attention. This entry was posted in In the news on September 13, 2016 by oliver. The face of downtown Brevard is changing again as a long-time East Main Street business is headed to the Brevard Lumberyard, and the building it currently sits in is up for sale. The Underground Salvage Co./Architectural Antiques, located on East Main Street, will soon move to a permanent home at the Brevard Lumberyard. Owner Tim Hall confirmed the move Tuesday. Hall said parking downtown was hindering his business. According to Josh Leder, owner of Brevard Lumberyard, the antique and architectural salvage company started making the move weeks ago, stating Hall had moved larger items into the space. A complete move to the larger space, located at 228 W. French Broad St ., will be made once the East Main building that currently houses the retail store is sold, which Hall estimated would be in March. Hall said an announcement would be made regarding the sale of the building in the future. Leder also made the announcement that a restaurant would be opening in the lumberyard. Magpie, a meat-plus-three-style restaurant, will open its doors in April or May, Leder said. The restaurant would give patrons a meat option plus three sides for a main course. Owners of the new restaurant could not be reached for comment. Hall said he tried to purchase Brevard Lumberyard when it was last up for sale. Hall said the plan for his business is to become a reclaimed lumber store that offers salvaged doors, window, mantels, heart pine and oak beams along with hardware salvaged from historic buildings and houses in Western North Carolina. He has also formed connections with demolition companies in the Midwest. This entry was posted in In the news on January 15, 2016 by oliver. Do you have a house full of guests? Looking for things to do? Explore the art galleries and art locales featured on the Brevard Thanksgiving Gallery Walk on Friday, Nov. 27, from 5-8 p.m. The Gallery Walk will feature new art exhibits, music, wine and beer tasting as well as local shopping. Hop on board the Oskar Blues Trolley, which will run from 6-8 p.m. with stops at the Visitor Center, Hunters & Gatherers, The Haen Gallery/Brevard Lumberyard Arts District and the TC Arts Council Gallery. Red Wolf Gallery will present a new artist for the Nov. 27 Gallery Walk. The featured artist this month is Van Martin with his impressive landscapes. Number 7 Arts Gallery will feature the work of three of its members: Lewis Bishop, Sonia Arnold and Joe Bruneau. This art show features the photography of R. K. Young, the paintings of Julie Bowland and the wood turning of Peter B. Mockridge. Stop by the TC Arts Gallery to meet the artists and to support Rosman High School senior Cassidy Knye. Knye is practicing the art of graffiti and various other forms for her senior project. Her purpose for this project, titled “Arts for the Arts,” is to not only improve her art skills, but also raise money for the theater program at Rosman High School. Knye will have her work on display and for sale during the gallery walk. Trade-Arama Folk Art & Antiques invites the public to stop by and see the new line of wearable stones by emmanyb, new florals by Cecel Allee and paintings by new artist, Jay Burriss. Just a block away from Trade-Arama, across from City Hall, stop in the Drew Deane Gallery. One of our newest galleries is Collective located on Jordan Street. With a variety of artists and mediums, there is something for everyone at Collective. The Chamber of Commerce & Visitor Center is featuring the work of Artsi Glass and will serve light refreshments. Artsi Glass is a fused glass art studio and gallery by Rachel S. Rogers and John F. Peil. Kiln-Fused glass artwork is created by using various complicated techniques with special glass to the desired effect. Open until 7 p.m ., the Visitor Center is a great place to park for the evening, hop on the trolley, and explore downtown. Main Street Ltd. will host a free wine tasting from 5-7 p.m. featuring great holiday wines. Next door in the Hollingsworth Gallery explore the featured artist Deborah Johnson Kidwell. She is a life-long New Englander now living in Brevard. Her works are original soft pastel on marble dust sanded paper. The show is entitled “Four and Twenty…Birds and Bird’s nest.” The small works are six inches by six inches and affordable for holiday giving. Kidwell teaches pastel and drawing classes at the TC Arts Council. Hunters and Gatherers will feature music by Blake Ellege and they will serve holiday specialty drinks. Local Color invites you to come in and see new work from their wonderful artists and crafters. Cool weather items are back, including wet felted wool items by Daryl Hayes, felted wool knit hats by Patti Dutton, crochet hats by Ruth Ann Brewer and knit hats by Linda Shepherd. In addition, check out Patty Consoli’s “Star Gazing” hanging gourd lamp, new up-cycled music themed creations from Art Wine and more. Broad Street Wines will be having music by Mike Sweet and a tasting of wines from the Rhone Valley in France. The White Squirrel Shoppe will be serving mimosas. D. D. Bullwinkel’s will be serving beer, wine and their famous pimento cheese. Wine Down on Main Street will feature Brevard photographer Ashley Lowe. 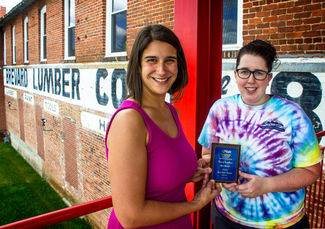 Lowe, a Brevard College graduate, recently was awarded the Regional Artist Grant from the NC Arts Council, TC Arts Council and the Arts Council of Henderson County. Visit The Haen Gallery at 200 King St. in the Brevard Lumberyard Arts District to experience new work by French artist Philippe Roussel, Atlanta photographer Kathryn Kolb, and Charlotte painter Marlise Newman. Savor a glass of wine and a bit of dessert while you enjoy a wide array of paintings, photographs and sculptures by dozens of artists. After the gallery walk, stay in the Lumberyard Arts District for the Hometown Holiday Jam at 185 King Street. Mike & Mike Present: the 10th annual Hometown Holiday Jam featuring Steep Canyon’s Mike Guggino and Mike Ashworth; dynamic duo Leigh Glass and Corey Bullman, Isaac Wells, Derrick Gardner, Noel Felty and surprise guests! There will be no tables or chairs inside the venue, so bring your dance shoes and come to boogie. For more information and tickets, visit 185king st.com. Due to the holidays, the last Gallery Walk of the 2015 Season is scheduled for Friday, Dec. 18. Gallery Walks will resume in April 2016. For a guide to the Gallery Walks, stop by any participating location or go to http://www.artsofbrevard.org and click on Art Tours. For more information, call the TC Arts Council at (828) 884-2787. The downtown art galleries, art spots and restaurants will host the Brevard 4th Friday Gallery Walk Oct. 23, beginning at 5 p.m. Tammy Hopkins, executive director of Transylvania Community Arts Council, invites visitors and the community to participate. “Fall is a special time here in the mountains. We invite the public to experience a fun evening of art and dining in our downtown community during this month’s gallery walk,” she said. The Oskar Blues Trolley will run from 6-8 p.m. with stops at the Visitor Center, Hunters & Gatherers, The Haen Gallery/Brevard Lumberyard Arts District and the TC Arts Council Gallery. Red Wolf Gallery will present the new paintings of North Carolina artist Ed Fadool. His paintings of barns and his exquisite use of color are not to be missed. The TC Arts Council will have an opening reception for its newest exhibit by members of the Connestee Art League. Members participating include Sandy Anton, Elaine Bailey, Linda Richardson Barrick, Suza-nne Crolley, Patricia Dennis, Joe Hagarty, Sandy Hemmer, Dorothy Holum, Cindy Jednaszewski, Suzanne Karnatz, Brenda Maund, Patricia Patterson, Rachael Rogers, Richard Ryder, Karen Tuttle, Barbara Walter, and Heidi Witmer. Chumbley paints on wood, uplifting and “make you smile” works of art. In many of his works he shows animals living, loving, laughing, and playing. Keane is an encaustic artist and bookbinder who is smitten with beeswax and bindings. Keane is now a full time exhibiting artist in the River Arts District of Asheville and a juried member of Southern Highland Craft Guild. The Lumberyard Arts District in Brevard will be buzzing as artists from The Haen Gallery, Circle Factory, and Lumberyard Studios gather to present new work, demonstrate techniques, and present installation art. Local artists J. Aaron Alderman, Mary Farmer, and Ben Nixon will be demonstrating techniques at The Haen Gallery. Alderman, a sculptor who works primarily in steel and cooper, and Mary Farmer, an encaustic artist, will both be creating new work on site while photographer Ben Nixon will be discussing the wet plate collodion process that is responsible for his body of work. Other gallery artists will also be on hand to discuss their artwork as guests see work by more than 30 artists, listen to live music by Bradford Carson, and enjoy a glass of wine and hors d’oeuvres. 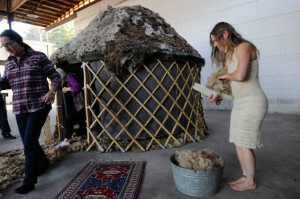 In the Courtyard next door to the Haen Gallery, Jenni Barron will be performing throughout the evening, in and around her 10-foot handmade yurt. This installation of “Symbiosis” documents a culmination of performance work regarding human relationships toward other mammals. Just behind the Courtyard on French Broad Street, Circle Factory artists Shellie Lewis, George Peterson, and Ashley Lowe will have an open studio with current work on display. Visitors are invited to peruse the studios, see work in progress and finished pieces, and talk with the artists. Lumberyard Studios at 145 King St. will also be open for Gallery Walk with Erin Jones, Cathy Goden, Sue Huggins, and Jenni Barron. They will open their studios with drawings, oil and acrylic paintings, as well as 2D and 3D fiber art on display for all to enjoy. There will be light refreshments and drinks as well as a collaborative spontaneous art creation to see and be a part of throughout the evening. Sound for the event will be performed by guest artist DJ Safarii. 185 King Street will feature the music of “Ellis Dyson & the Shambles” starting at 8 p.m. This is Prohibition-era inspired original music, with influences ranging from ragtime, swing, gypsy jazz and Appalachian folk. Enjoy folk art and autumnal refreshments at the Trade-Arama Folk Art Gallery! Then explore Gravy where a percentage of all sales go to the local Cindy Platt Boys & Girls Club of Transylvania County. In the Times Arcade Alley, The Square Root will have live music starting at 7 p.m. by the band Carver and Carmody. The White Squirrel Shoppe will be open late and serving mimosas. COLLECTIVE located on Jordan Street will be having an Art Opening for artist Holly Grant and live music from Crysalis. They will also have creative vendors for the Pop Up Market with original art, jewelry, ceramics, textiles and more. They will be offering light eats and drinks. The Pop Up Market runs from 5-10 p.m. The Chamber of Commerce & Visitor Center is featuring the work of Artsi Glass and will serve light refreshments. Artsi Glass is a fused glass art studio and gallery with works by Rachel S. Rogers and John F. Peil. Kiln-fused glass artwork is created by using various complicated techniques with special glass to obtain the desired effect. Glass is available in many different forms: sheet glass, textured glass, rods, stringers, frit (small chips or bits) as well as powdered glass. Open until 7 p.m ., the visitor center is a great place to park for the evening, hop on the trolley, and explore downtown. The Hollingsworth Gallery is hosting members of the Land of Waterfalls Photography Club with fascinating images taken by local photographers Ginny Bedell, Don Voltz, Ken Voltz, Jack Christfield, Nancy Dumville, Spike Dumville, Robert Krause and Don Lander. The artists will be on hand to greet the public. Main Street Ltd. presents a free wine tasting from 5-7 p.m. Doug Parker from Skyland Distributing will be pouring. Local Color has new creations from artists and crafters. Cool weather items are back, including wet felted wool items by Daryl Hayes, felted wool knit hats by Patti Dutton, crochet hats by Ruth Ann Brewer and knit hats by Linda Shepherd. In addition, check out Patty Consoli’s gourd art, Brevard Beer Card Company, and Jeanie Bernard’s hand painted postcards. George Peterson will be one of the featured artists at Circle Factory located on French Broad Street in the old church just behind The Haen Gallery. D. D. Bullwinkel’s features an eclectic mix of fun and useful goods for casual mountain living. They will be serving beer, wine and their famous pimento cheese, as featured in Southern Living. Hunters and Gatherers features musician David McCall. The Drew Deane Gallery will feature Susan Harb with an Outside Art Pop-Up Show. They will also serve wine and munchies. Broad Street Wines is hosting a free wine tasting from 5-8 p.m. and over at Underground Salvage, try samplings of Oskar Blues Beers. Wine Down on Main will have featured artists the McConnell Sisters, who collaborate on innovative and dimensional painting techniques. The Gallery Walks are scheduled for the fourth Friday of every month April through November with the December Gallery Walk slated for Dec. 18 due to the holidays. For a guide to the Gallery Walks stop by any participating location or go to http://www.artsofbrevard.org and click on Art Tours. For more information, call the TC Arts Council at (828) 884-2787. The dessert category was won by Blue Ridge Bakery for their Flourless Chocolate Cake infused with Chile pepper and served with a blood orange sauce. 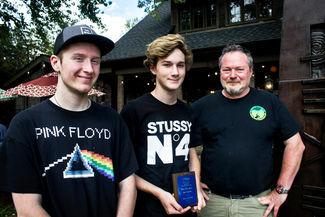 The Transylvania County Schools Educational Foundation (TCSEF) is finishing up a successful year by honoring their winners of the “Best” categories from the annual Taste of Transylvania event. Taste of Transylv-ania Chair Courtney Mason presented the winning restaurateurs with their awards last week. The Annual Taste of Transylvania event, the primary fundraiser for the Transylvania County Schools Educational Foundation (TCSEF), was held on the grounds of the Brevard Lumberyard Tuesday evening, May 7. The remodeled venue combined with the generosity of so many community vendors allowed the fundraiser to more than double its previous earnings to a new record of $17,000. Special thanks are owed to the lead sponsors of the evening: First Citizens Bank, Domokur Architects, Brevard Lumberyard, Comporium, Broad Street Wines, Transylvania Regional Hospital, Oskar Blues, WSQL, McNeely Rental, Meredith Baldridge State Farm Insurance, Linda Martinson and Andy Stratton. The TCSEF exists to provide financial support to the Transylvania County Schools in the form of grants to teachers and programs that benefit the students. Since its reformation in 2008, the TCSEF has provided funding for a variety of different opportunities within the schools. During this past school year, TCSEF sent a Brevard High School student to an all expenses paid Washington, D.C. immersion program to study government and politics in the nation’s capitol. In addition, TCSEF awarded more than $15,000 to provide funding for 27 different teacher sponsored grant programs. As the fund balance of the TCSEF grows, so does its ability to increase its support of teachers and students. Due to the success of this year’s event, the foundation will raise its level of grant funds to $18,000 for the 2015-2016 school year. This is a 50 percent increase in grant funding in two years. The grant application process is currently underway. The Taste of Transylvania is one of the most enjoyable benefits held in this community, and this year was an amazing success. Those attending were able to enjoy the best of offerings from our local restaurateurs, caterers and food service operations. Additionally, Oskar Blues and Broad Street Wines were on site to provide information and education about their products. The Oskar Blues Trolley assisted with transportation through the King Street neighborhood for ease of parking. Marco Trattoria won Best Appetizer for their Tuna Seaweed Salad. 185 King, Blue Ridge Bakery, Cedar Mountain Café, Chameleon Catering food truck, The Chubb Wagon food truck, Dugan’s Pub, The Falls Landing, The Hob Nob, Jaime’s Creole Brasserie, Jordan Street Café, Key Falls Inn, Marco Trattoria, The Phoenix and Wild Indigo Catering. The highlight of the evening was the vote held for the favorite item in each of the divisions: appetizer, entrée, and dessert. Marco Trattoria won Best Appetizer for their Tuna Seaweed Salad. Chameleon Catering Food Truck took the Best Entrée category with their Shrimp and Grits. The dessert category was won by Blue Ridge Bakery for their Flourless Chocolate Cake infused with Chile pepper and served with a blood orange sauce. The next Taste of Transylvania will be held Tuesday, May 3, 2016. For more information on the TCSEF, visit http://www.tcsef.org, or contact Page Lemel at 884-9125. This entry was posted in In the news and tagged brevard lumberyard, taste of transylvania on November 24, 2015 by oliver. Volunteers from the Children’s Center, Friends of Silvermont and their friends have been busy preparing for the “Revenge of the White Squirrels” and “Lighted Pumpkin Patch” events that will take place, starting Oct. 9. on the Silvermont grounds. 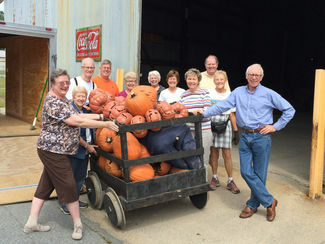 The extensive collection of lighted pumpkin and other Halloween decorations that were previously part of the “Stingy Jacks” display in Pisgah Forest have been donated to the county. Using these decorations, the Children’s Center and Friends of Silvermont will transform Silvermont as witches, pirates, spiders, bats, scary squirrels and jack-o-lanterns stage a haunting. Children’s activities will feature a “Scary Squirrel Search,” walks through the “Haunted Pumpkin Patch” trails, numerous games and refreshments. To begin preparing for the event, volunteers moved the collection of thousands of carved pumpkin decorations from the barn at the “Mountains & Meadows” property of Alisha Swicegood, donor of the “Stingy Jacks” collection. Josh Leder, owner of Brevard Lumberyard, has made one of his storage areas available for staging of the decorations. Page Lemel, owner of Keystone Camp, has offered a Quonset hut on the camp property for permanent storage of the decorations when they are not being used. In addition to these community-spirited helpers who are already contributing efforts, the groups are seeking additional volunteers to help with moving and set-up on the grounds, as well as staffing of the event. Contact Pinkie Byrd at pinkieby@gmail.com or (828) 885-8201 to volunteer. The Pumpkin Patch events will be open from 6:30 p.m. to 10 p.m. every Friday and Saturday night in October beginning Oct. 9 at Silvermont on East Main Street in Brevard. The cost will be $5 per person, with proceeds going to benefit Silvermont and The Children’s Center. During the event, no parking will be available at the park except for handicapped parking. The trails are wheelchair and stroller accessible. For more information, call 885-7286 or visit http://www.facebook.com/pump kinpatchrevenge. A local artist is hoping a sculpture foundry will help draw thousands of tourists and artists to Brevard, expanding an already vibrant art community and help art become the driving force of the local economy. 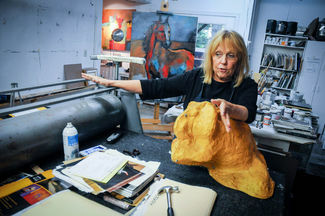 Brevard artist Ann DerGara is looking to build a sculpture foundry at the Brevard Lumberyard, located off King Street and Railroad Avenue, in hopes of providing artists a place to cast sculptures as well as being an art tourism destination. “When you increase the arts in an area, you increase the tourism,” DerGara said. DerGara is part of a growing arts community that has helped a city once flourishing with industry and manufacturing reinvent itself. She’s hoping a foundry will throw fuel on to the fire. A foundry is typically a factory designed to produce metal castings. 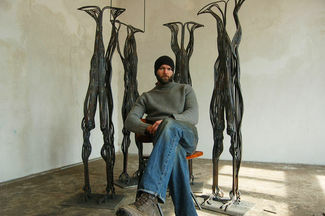 In this case, the metal castings are sculptures created by an artist. In the process, an artist will create an original sculpture in clay, wax or wood and then make a two-part mold encasing which hot bronze, or other metal, is eventually poured in, creating the sculpture. 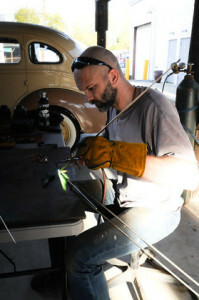 DerGara said foundries are very popular with artists and there are only a handful of them in the U.S ., creating a high demand for those that exist. The lack of foundries forces artists to travel far, spending money on resources, just to be able to create their work. 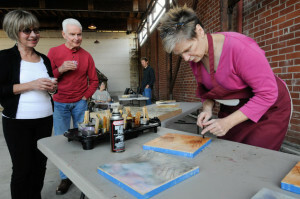 The closest foundry for Asheville area artists is located in Atlanta, DerGara said. The foundry draws not just the artists that use the facility, but thousands of tourists who show up in droves to watch the pouring of hot metal during the creation of the sculptures. “If we could attract these people, we would help the economy,” she said. According to a study by the North Carolina Arts Council, visitors of nonprofit arts and culture programs from outside the region spend an average of nearly $60 per person in the community beyond the cost of the event. The same study said all nonprofit cultural audiences spend $60.7 million a year and nonprofit arts organizations contribute $79 million to the Western North Carolina economy each year. Together, nonprofit arts groups and their audiences return more than $6 million in annual revenue to local governments. Lumberyard owner Josh Leder said a foundry would make a great addition to the popular arts district and that more art attractions would help take an area already seeing growth from art tourism to the next level. “Everyone knows this is an upcoming area,” Leder said. City planning officials acknowledged DerGara has been working with them on plans for the foundry but that nothing had been finalized yet. The foundry would be set up as a not-for-profit. However, DerGara estimates the foundry would be a source of income, which would be poured back into the local art community. DerGara has raised an undisclosed amount of money to get the project rolling and is continuing fundraising efforts until goals are met. She said she would need to raise enough money to not only build the foundry but to employ two full-time employees who’d run the facilities and programs. She hopes to have full casting services, educational workshops, artwork shows and sales as well as an outdoor sculpture garden. “A facility like this, here, people would come from everywhere to watch it,” said DerGara. To donate to the foundry project, checks can be made out to Community Focus Foundation/Brevard Sculpture Project/Foundry and sent to Ann DerGara, Red Wolf Gallery, 8 E. Main St ., Brevard N.C. 21847. All donations are tax deductible. For more information on how to become involved in the project, contact DerGara or Tom Cabe at (828) 862-8620. After creating a calendar of all the events in the past year or more at the Brevard Lumberyard, Josh Leder noticed those events were helping define a vision for the site. “It’s a gathering spot and a place to build community,” said Leder, who in the summer of 2012 bought the 2.5-acre former lumberyard on King Street. The events have ranged from school fundraisers, including the Brevard High School Chorus to Taste of Transylvania, to numerous art shows, free film showings and a location for video shoots by local musicians. “The direction that the Lumberyard has taken has been more about the community than about the owners,” Leder said. Leder said he’s “embraced” what has “naturally evolved” at the site and is now looking for a permanent tenant to occupy a renovated 5,000-square-foot indoor space and a 10,000-square-foot outdoor/covered space. The Haen Gallery at Lumberyard Arts occupies an adjacent space. Leder is excited not only about the Lumberyard, but other ventures in the Railroad Avenue area, including artist studios, such as the Circle Factory, and 185 King Street, a popular live music venue located opposite the Lumberyard. Leder said Jackson Wine, 185 King Street’s owner, has done an “incredible job” with the venue. “I’m thankful and encourage by his success,” said Leder, who believes the Lumberyard and the surrounding Railroad Avenue can become a local and regional destination and, ultimately, a “huge economic driver” for the community. The city also has hopes for the area. During its retreat Thursday, Brevard City Council received an update on the Railroad Avenue Small Area Plan, which proposes sidewalk, utilities and streets improvements, and possible zoning changes to allow more mixed uses to spur investment. 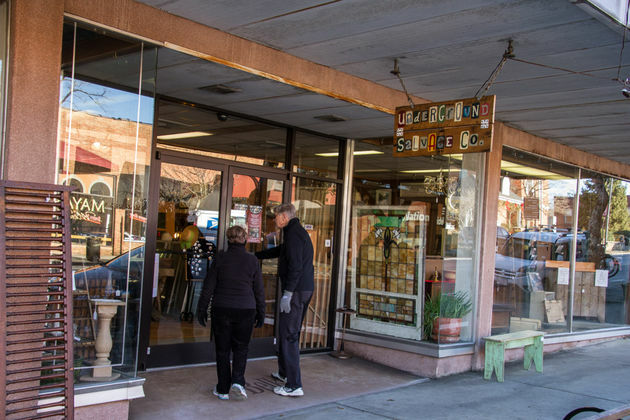 The plan hasn’t been finalized, but city officials see the area, which was Brevard’s commercial center before it moved to Main Street, being a popular arts district one day. The Brevard Lumberyard is part of a growing trend of redevelopment of “rough” former industrial areas across the country, showing “what is old is now new,” Leder said. Leder has a love for the building’s history and the old signs that adorn it. It “pains” him, he said, that the old railway station was torn down in the 1980s. As part of honoring the lumberyard’s past and the people who worked there, Leder commissioned the painting of a large mural (see below) showing a man sitting on the tailgate of a truck. “We created a mural that could be a symbol of a time and place that was once the center of commerce,” Leder said. Leder said they’ve “just started” at the Lumberyard, and he’s anxious to see what a Calendar of Events may look like five, 10 years from now. For more information, call (828) 553-5836 or go to brevardlumberyard.com. This entry was posted in In the news on February 24, 2014 by oliver. Brian Tull, an awarding-winning artist from Tennessee, with help from his wife, Laura, painted the large mural of a man sitting on the tailgate of a truck on the wall at the Brevard Lumberyard. “Like all of my paintings, my inspiration starts off with nostalgia,” Tull said. “I wanted to capture the spirit of a hard working, small-town person taking a break and reflecting on his community and the good in it. “I visited Brevard for the first time early last year. The idea, thankfully, came to me fairly quickly. I think Josh Leder’s decision to preserve the Lumberyard’s name and what it stood and stands for is very wise. I wanted to carry that over to the mural, as well, and make the background, as well as the top hand-painted letters, look a little distressed; prompting the viewer to ask if it’s been there awhile. Tull showed up with a brown paper sack, old thermos, apple and a camera. He shot about 200 reference photos and edited them all down to choose the final image. Laura did all the “underpainting” and the filling in of colors on the entire truck portion of the mural. Tull came back through and blended it all together. It took around 29 days to paint the mural. Every quart of paint came from the local Sherwin Williams in Brevard. 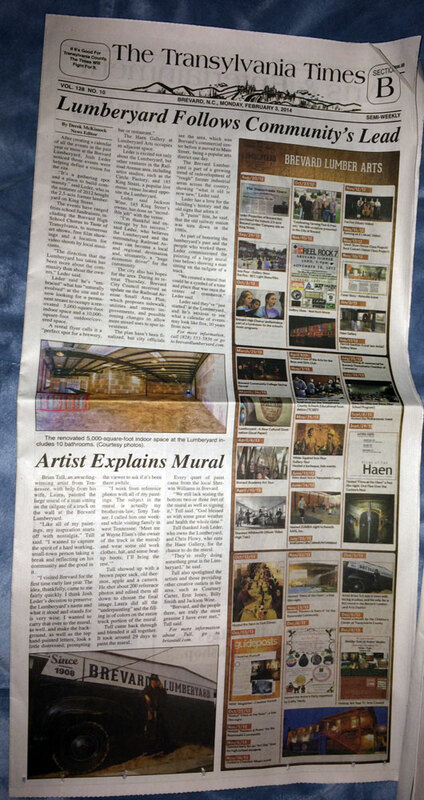 Tull thanked Josh Leder, who owns the Lumberyard, and Chris Flowy, who runs the Haen Gallery, for the chance to do the mural. “They’re really doing something great in the Lumberyard,” he said. Tull also spotlighted the artists and those providing other creative outlets in the area, such as Courtney Carter, Erin Jones, Billy Smith and Jackson Wine. “Brevard, and the people there, are truly the most genuine I have ever met,” Tull said. For more information about Tull, go to briantull.com.